There is only one trim on the BMW 1 Series Sedan Electric. Like any other BMW the ActiveE is loaded with creature comforts. One step inside the cabin will showcase this luxury to anyone. The outside of the ActiveE boasts several bonuses as well. The coloring itself is unique to this model. It boasts white, silver and streaks of blue that symbolize the electricity. The same coloring is used inside the cabin with plenty of popping accents. 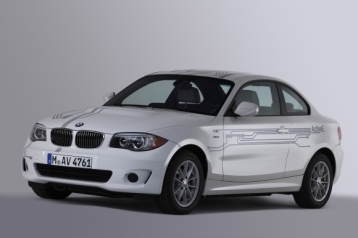 One of the benefits of the BMW 1 Series Sedan Electric is the ability to never forget it is on and leave it running. The car will automatically go into park and power off whenever the door is opened. Not only is this beneficial, it provides more safety because there is no chance of leaving the car on and having it roll. It also helps to preserve the electricity. Without this feature, and considering the quiet of the cabin, it would be easy to leave it on and have the battery drained by the time it was realized. There is also a brake regenerative system, a rear fascia that is completely closed, rolling resistant tires on 16 inch alloy wheels and a sporty appearance. Inside there are special leather seats, a specially designed instrument panel, cruise control, speed warning system, heated leather seats, heat and air conditioning, climate control, ConnectedDrive, Bluetooth and BMW Connect. When inside the interior it would be hard to distinguise the BMW 1 Series Sedan Electric from any other BMW with the exception of the styling cues it possesses. The same luxury, comfort and features are available in all models. The BMW 1 Series Sedan Electric is not a vehicle that one compares to others. It has its own unique benefits and possibilities. Like any other BMW there is a steep price tag, but the luxury and comfort in the vehicle often make up for it. It has the power to handle most city driving needs and was designed based on research. It likely will not be the only electric car offered by the company, but it is definitely going to be a class leader for some time. The decision on buying one is something that should be made based on needs and preferences. However, with the limited number being offered it might be a decision that should be made quickly.